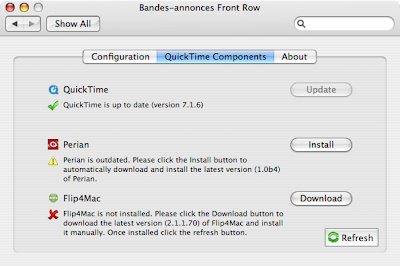 The upcoming version of Bandes-annonces Front Row will be international. 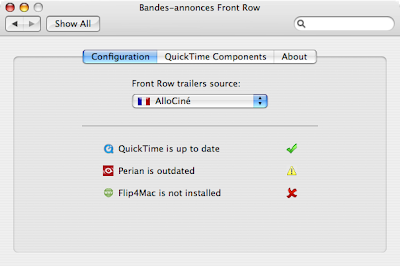 For those who don't know, Bandes-annonces Front Row enables you to change the trailers you watch inside Front Row. In the previous version, trailers came from AlloCiné, a french cinema site. In the upcoming version, the user will have several choices. I'm looking for a german translator as one of the source provides german trailers. So if you are interested in watching german trailers inside Front Row and if you would like to spend a few minutes to translate Bandes-annonces Front Row, please post a comment. Here are some screenshots so that you have an idea of what it looks like. Le 7 mai, MacBidouille a parlé de Bandes-annonces Front Row dans ses news. Résultat: une augmentation de la fréquentation aussi spectaculaire que soudaine. Mon hébergeur n'a d'aillers pas tenu le coup et certains ont eu des soucis pour télécharger Bandes-annonces Front Row. Je trouverai mieux pour la prochaine version, même si la fréquentation ne sera certainement pas aussi grande.